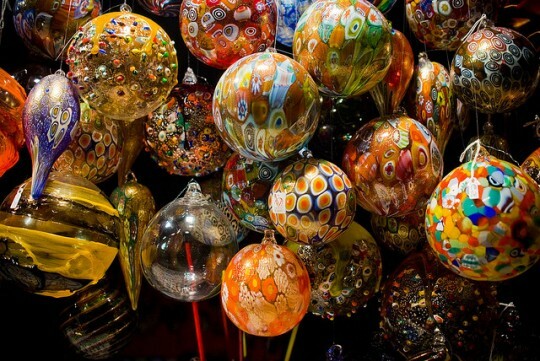 Piazza Navona Christmas market in Rome is on the list of best European Christmas Markets. It is on the ancient site of the Circus of Domitian and has the shape of a stadium because of the games played there in ancient times. 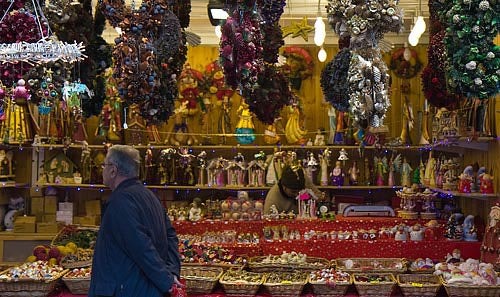 As the Christmas season nears, the vendors set up their toys, ornaments and delicious Italian sweets. 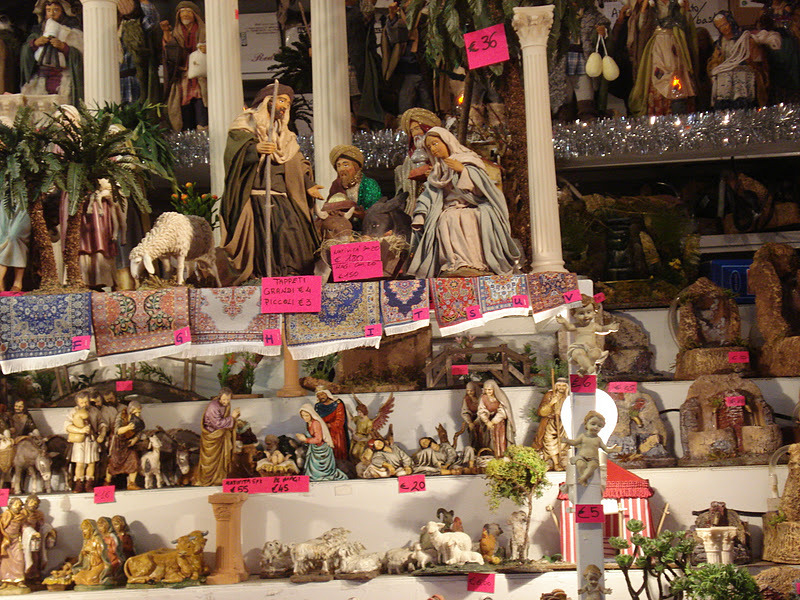 One of my favorite items were the Christmas figures for the manger scene. 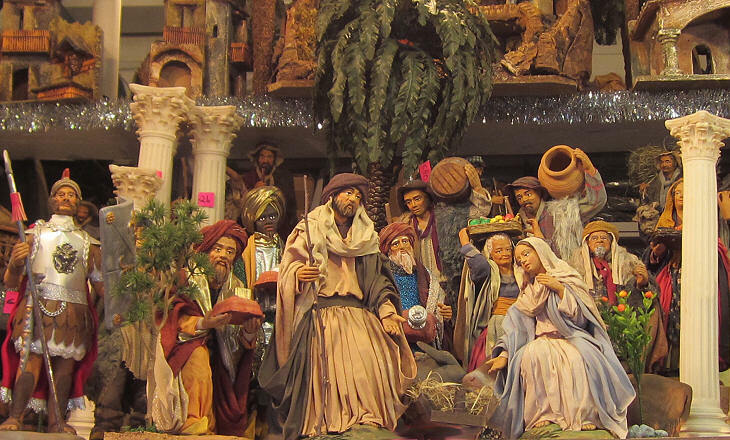 It is very difficult and terribly expensive to get the hand-carved wooden figures, but I did see them for sale in the shops near the Vatican. The ones on sale at Navona were plastic but the gifted Italian artists worked their magic with plastic and the expressions and details of clothing etc. are wonderful and the price is much more reasonable. The last time I went with my husband for a semester in Rome, the students were frantically finishing their design project spending lots of hours on “charette”. ( French word meaning working night and day to finish a project. ) This seems to be the model for architecture students in all countries .. . . . .finishing at the last minute. Well the students didn’t want to be doing this work and missing their last days in Roma. 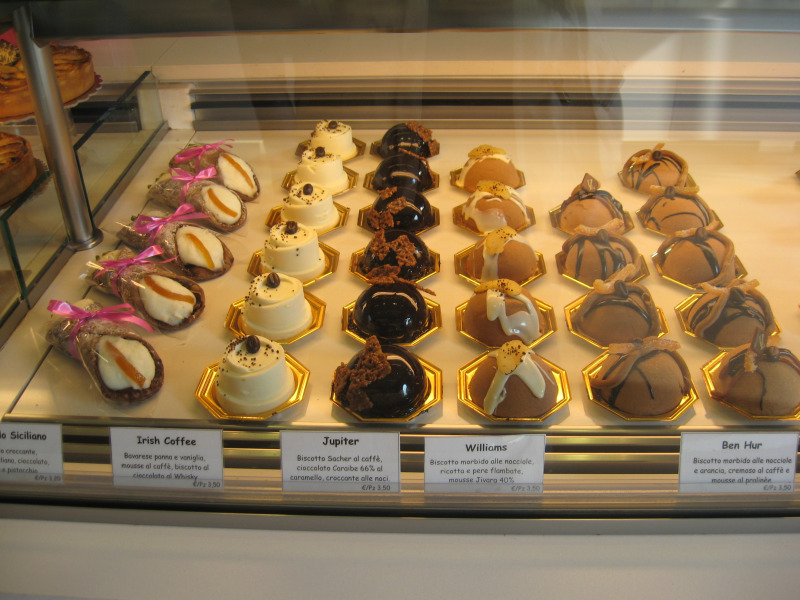 The professor went daily to Navona and bought sweets for a treat for them. He would sit and read in the studio to “encourage work and perseverance!” A posting and exhibition were planned for the last few days where students from other Roman studies’ programs would visit. Quality work was and is important to the professor! One day, Emily called out to David after his candy delivery, “David, are you babysitting?” Which was exactly what he was doing! Here are some images of Piazza Nanona at Christmas time! 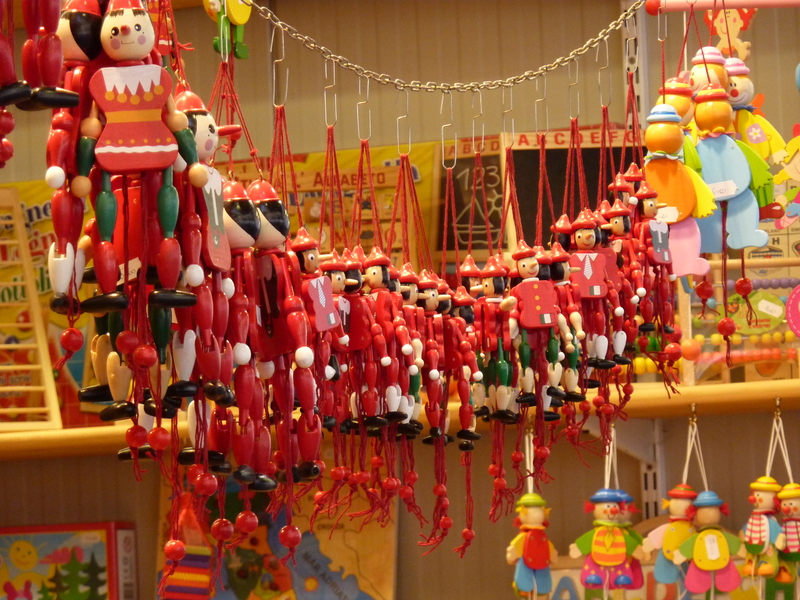 Pinocchio was started in Italy and is a popular children’s gift as well as other puppets. 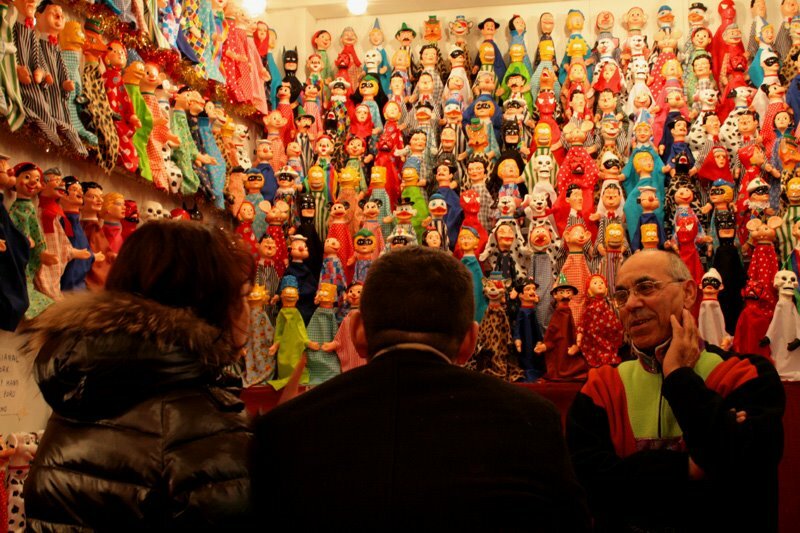 Puppets are very popular in Italy. I remember traveling around and coming into a small town, going to the piazza in the centro and there would be a puppet show. The most popular are slap-stick stories of Punch and Judy. Men , women, and children would laugh, wildly, at the foolishness! Stuffed animals galore. . . . . . Here are some of the delicious sweets! Decorations and some of the manger figures. . . . .
Beautiful, delicate tree ornaments. . . . . .
Yummy. . . . . 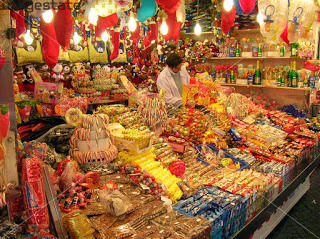 Kid heaven. . . . . . . . . . . I loved the columns instead of the stable or cave. We bought some columns to use in our nativity. Not bad for plastic figures, right? Lots of styles and sizes are available. . . . . . .
Buon Natale. . . . . . . . This magical Christmas square is now only a memory ! Fabulous! 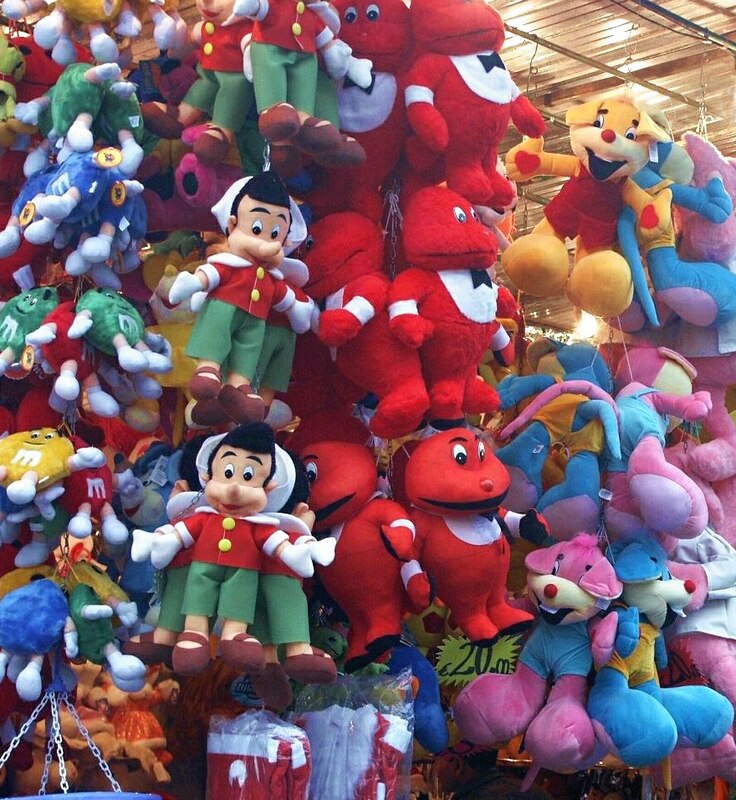 I love seeing all those Pinocchio dolls hanging together. 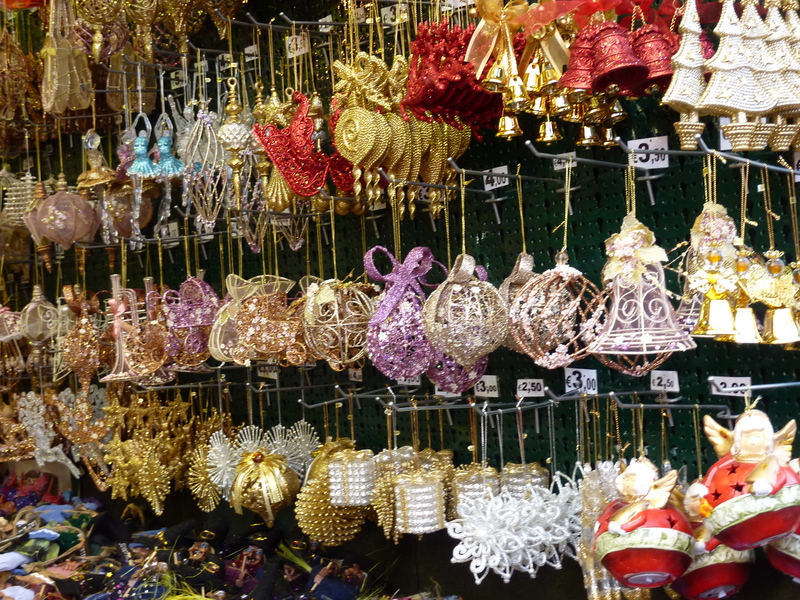 The whole market looks brilliantly lighted in your first picture — what a fun way to spend the season! I feel very lucky to have been there anytime of the year and especially at Christmas time! 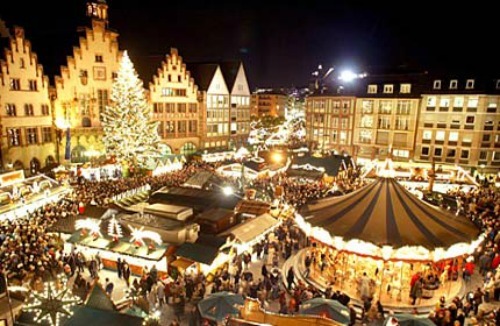 I would love to go to a German Christmas market. I love the wooden items they make. We were in Paris before Christmas one year after leaving Rome. They French had their own style and take on traditional items. 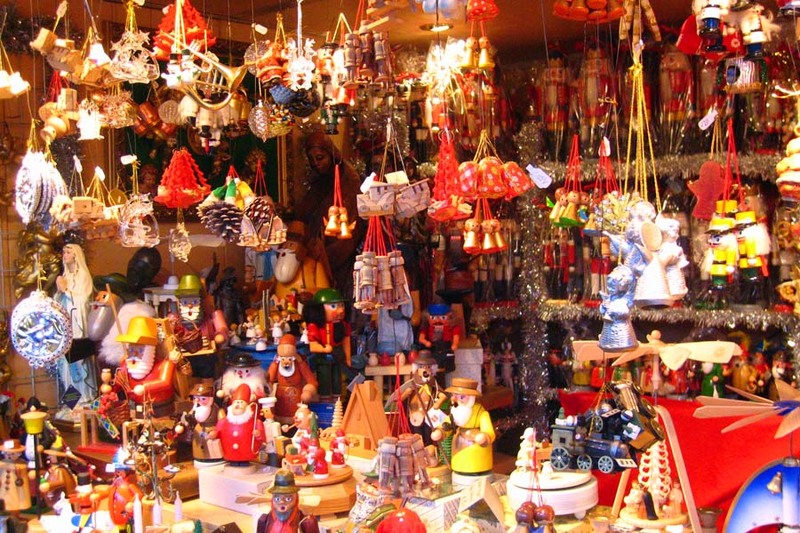 I know what fun it would be to just tour and visit Christmas markets…..don’t think my husband would think much of the idea! Oh to be independently wealthy! Thank you for a very happy reminder of the holiday we had in Rome in December ten years ago. The Piazza Navona was magic. Oh thank you for responding. Indeed Navona is magic and totally unforgettable! Buon Natale! Be careful not to grab too tight as they are quite fragile! LOL…..Merry Christmas! And a very Merry Christmas to you ! And a Happy Christmas to you , dear Andrea! Thanks for the above, I recently returned from a trip to Rome and didn’t have a chance to buy a painting from the Piazza Navona. I was hoping that perhaps some of the artists who sell their works in that square also sell them online or make them available for purchase online. Gosh , I don’t know from experience but just about everything is available on the internet . Let me know . Merry Christmas . . . .
Annette, what an experience. I’m sure I would have bought a lot of those beautiful Christmas decorations and a nativity scene also. Suz, I am so glad to share this with you . It was a wonderful experience. Happy New Year! A Roman Christmas market. . . . . .
Merry Christmas Anne, and have a lovely and wonderful New Year! Merry Christmas to you , too, my friend! Better check for 2015/2016 Christmas season. Piazza Navona no longer has a Christmas fair effective 2014/2015 season. Oops! I will add this to the post . Thanks. Thanks. I updated the post! This entry was posted in Religions of the World, Uncategorized and tagged Buon Natale, Christmas in Roma, gifts, Merry Christmas, Piazza Navona, Piazza Navona Christmas Market, sweets, travel. Bookmark the permalink.